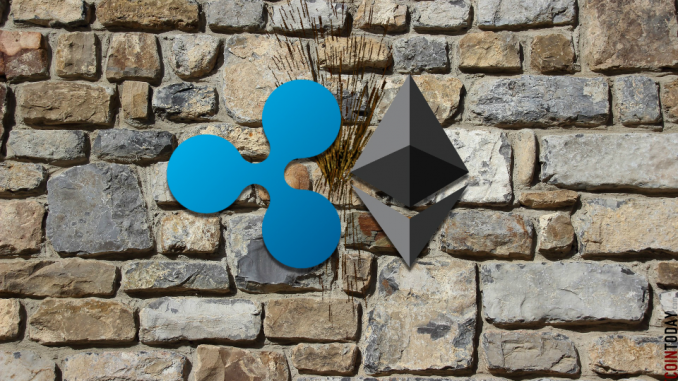 Ripple (XRP) and Ethereum (ETH) have gone back and forth plenty of times for the 2nd most valued cryptocurrency spot. The changes also happened in the last 24 hours once again. Ripple (XRP) currently ranks at the 2nd position market cap. Ethereum (ETH) lost once again which and is not at the 3rd sport. The tussle will continue for the foreseeable future. The difference in the market cap of both of these cryptocurrencies is pretty small. That is why the tussle is likely to continue. The current price of Ripple (XRP), is around $ 0.32. The market cap is about $ 13.42 billion. The market cap of Ethereum (ETH) is around $ 12.77 billion. The price of Ethereum (ETH) is around $ 122. The difference in the market cap of both of these cryptocurrencies is approximately 5%. The difference is so low that intraday movement, can quickly change the position of the cryptocurrencies once again when it comes to market cap. The movement in the cryptocurrency market is lackluster. Most of the mainstream cryptocurrencies are trading flat. Ripple (XRP) is down by just 0.62% and Ethereum (ETH) is up by only a 0.01%. Thus, today there seems to be no action in the cryptocurrency markets. However, if momentum picks up during the latter part of the day, the positions can once again reverse. One of the exciting things about both the cryptocurrencies is that they have fallen significantly from their peak. Thus, both of them have a long way to go when it comes to recovery. Ripple (XRP) has fallen from $ 3.52 to a current price of $ .32. Similarly, Ethereum (ETH) has fallen from approximately from $ 1200 to current price of $ 122. When you look at the path to recovery, it is a pretty long for both the cryptocurrencies. There are chances that during recovery, they might interchange places once again. When you look at the fundamentals of both of these cryptocurrencies, Ripple (XRP) is consistently tying up with newer companies increase the use of its RippleNet products. On the other hand, Ethereum (ETH) is suffering due to the stagnant ICO market and scalability issues. Thus, when it comes to fundamentals, Ripple (XRP) definitely has an advantage. This interchange of places might happen more than once in the coming few months as well. If Ripple (XRP) can create a sizable lead, this might not happen. Ethereum (ETH) News – What is holding back Ethereum (ETH) futures?